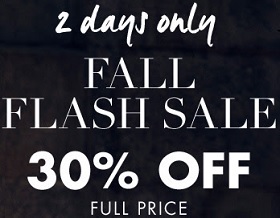 Only hours left when you can save during Flash Sale at Nine West online. Receive 30% discount on all regular priced items when you shop online. Discount is taken at checkout. Plus, free shipping is valid on orders of $75 or more for a limited time only. Source of the information is Nine West. The offer expires today (09/08/2016). For more details visit Nine West online.